Elderly patients with dementia-related psychosis treated with antipsychotic drugs are at an increased risk of death. Analyses of seventeen placebo-controlled trials (modal duration of 10 weeks), largely in patients taking atypical antipsychotic drugs, revealed a risk of death in drug-treated patients of between 1.6 to 1.7 times the risk of death in placebo-treated patients. Over the course of a typical 10-week controlled trial, the rate of death in drug-treated patients was about 4.5%, compared to a rate of about 2.6% in the placebo group. Although the causes of death were varied, most of the deaths appeared to be either cardiovascular (e.g., heart failure, sudden death) or infectious (e.g., pneumonia) in nature. Observational studies suggest that, similar to atypical antipsychotic drugs, treatment with conventional antipsychotic drugs may increase mortality. The extent to which the findings of increased mortality in observational studies may be attributed to the antipsychotic drug as opposed to some characteristic(s) of the patients is not clear. GEODON (ziprasidone) is not approved for the treatment of patients with Dementia-Related Psychosis [see Warnings and Precautions (5.1)]). These highlights do not include all the information needed to use GEODON safely and effectively. See full prescribing information for GEODON. The full prescribing information contains additional drug interactions (7). Pregnancy: Ziprasidone should be used during pregnancy only if the potential benefit justifies the potential risk (8.1). Geodon is indicated for the treatment of schizophrenia. The efficacy of oral ziprasidone was established in four short-term (4- and 6-week) controlled trials of adult schizophrenic inpatients and in one maintenance trial of stable adult schizophrenic inpatients [see Clinical Studies (14.1)]. Geodon is indicated as monotherapy for the acute treatment of manic or mixed episodes associated with bipolar I disorder. Efficacy was established in two 3-week monotherapy studies in adult patients. [see Clinical Studies (14.2)]. Geodon is indicated as an adjunct to lithium or valproate for the maintenance treatment of bipolar I disorder. Efficacy was established in a maintenance trial in adult patients. The efficacy of Geodon as monotherapy for the maintenance treatment of bipolar I disorder has not been systematically evaluated in controlled clinical trials. [see Clinical Studies (14.2)]. "Psychomotor agitation" is defined in DSM-IV as "excessive motor activity associated with a feeling of inner tension." Schizophrenic patients experiencing agitation often manifest behaviors that interfere with their diagnosis and care, e.g., threatening behaviors, escalating or urgently distressing behavior, or self-exhausting behavior, leading clinicians to the use of intramuscular antipsychotic medications to achieve immediate control of the agitation. Efficacy in schizophrenia was demonstrated in a dose range of 20 mg to 100 mg twice daily in short-term, placebo-controlled clinical trials. There were trends toward dose response within the range of 20 mg to 80 mg twice daily, but results were not consistent. An increase to a dose greater than 80 mg twice daily is not generally recommended. The safety of doses above 100 mg twice daily has not been systematically evaluated in clinical trials [see Clinical Studies (14.1)]. While there is no body of evidence available to answer the question of how long a patient treated with ziprasidone should remain on it, a maintenance study in patients who had been symptomatically stable and then randomized to continue ziprasidone or switch to placebo demonstrated a delay in time to relapse for patients receiving Geodon. [see Clinical Studies (14.1)]. No additional benefit was demonstrated for doses above 20 mg twice daily. Patients should be periodically reassessed to determine the need for maintenance treatment. Dose Selection--Oral ziprasidone should be administered at an initial daily dose of 40 mg twice daily with food. The dose may then be increased to 60 mg or 80 mg twice daily on the second day of treatment and subsequently adjusted on the basis of tolerance and efficacy within the range 40 mgâ€“80 mg twice daily. In the flexible-dose clinical trials, the mean daily dose administered was approximately 120 mg [see Clinical Studies (14.2)]. Intramuscular: Ziprasidone intramuscular has not been systematically evaluated in elderly patients or in patients with hepatic or renal impairment. As the cyclodextrin excipient is cleared by renal filtration, ziprasidone intramuscular should be administered with caution to patients with impaired renal function. Dosing adjustments are not required on the basis of gender or race [see Use in Specific Populations (8)]. 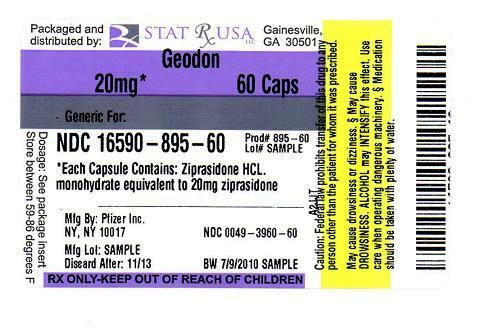 GEODON for Injection is available in a single-dose vial as ziprasidone mesylate (20 mg ziprasidone/mL when reconstituted according to label instructions) [see Dosage and Administration (2.3)]. Each mL of ziprasidone mesylate for injection (when reconstituted) affords a colorless to pale pink solution that contains 20 mg of ziprasidone and 4.7 mg of methanesulfonic acid solubilized by 294 mg of sulfobutylether Î²-cyclodextrin sodium (SBECD). dofetilide, sotalol, quinidine, other Class Ia and III anti-arrhythmics, mesoridazine, thioridazine, chlorpromazine, droperidol, pimozide, sparfloxacin, gatifloxacin, moxifloxacin, halofantrine, mefloquine, pentamidine, arsenic trioxide, levomethadyl acetate, dolasetron mesylate, probucol or tacrolimus. other drugs that have demonstrated QT prolongation as one of their pharmacodynamic effects and have this effect described in the full prescribing information as a contraindication or a boxed or bolded warning [see Warnings and Precautions (5.2)]. Ziprasidone use should be avoided in combination with other drugs that are known to prolong the QTc interval [see Contraindications (4.1), Drug Interactions (7.4)]. Additionally, clinicians should be alert to the identification of other drugs that have been consistently observed to prolong the QTc interval. Such drugs should not be prescribed with ziprasidone. Ziprasidone should also be avoided in patients with congenital long QT syndrome and in patients with a history of cardiac arrhythmias [see Contraindications (4)]. In placebo-controlled trials, oral ziprasidone increased the QTc interval compared to placebo by approximately 10 msec at the highest recommended daily dose of 160 mg. In clinical trials with oral ziprasidone, the electrocardiograms of 2/2988 (0.06%) patients who received GEODON and 1/440 (0.23%) patients who received placebo revealed QTc intervals exceeding the potentially clinically relevant threshold of 500 msec. In the ziprasidone-treated patients, neither case suggested a role of ziprasidone. One patient had a history of prolonged QTc and a screening measurement of 489 msec; QTc was 503 msec during ziprasidone treatment. The other patient had a QTc of 391 msec at the end of treatment with ziprasidone and upon switching to thioridazine experienced QTc measurements of 518 and 593 msec. A study evaluating the QT/QTc prolonging effect of intramuscular ziprasidone, with intramuscular haloperidol as a control, was conducted in patient volunteers. In the trial, ECGs were obtained at the time of maximum plasma concentration following two injections of ziprasidone (20 mg then 30 mg) or haloperidol (7.5 mg then 10 mg) given four hours apart. Note that a 30 mg dose of intramuscular ziprasidone is 50% higher than the recommended therapeutic dose. The mean change in QTc from baseline was calculated for each drug, using a sample-based correction that removes the effect of heart rate on the QT interval. The mean increase in QTc from baseline for ziprasidone was 4.6 msec following the first injection and 12.8 msec following the second injection. The mean increase in QTc from baseline for haloperidol was 6.0 msec following the first injection and 14.7 msec following the second injection. In this study, no patients had a QTc interval exceeding 500 msec. Hyperglycemia, in some cases extreme and associated with ketoacidosis or hyperosmolar coma or death, has been reported in patients treated with atypical antipsychotics. There have been few reports of hyperglycemia or diabetes in patients treated with GEODON. Although fewer patients have been treated with GEODON, it is not known if this more limited experience is the sole reason for the paucity of such reports. Assessment of the relationship between atypical antipsychotic use and glucose abnormalities is complicated by the possibility of an increased background risk of diabetes mellitus in patients with schizophrenia and the increasing incidence of diabetes mellitus in the general population. Given these confounders, the relationship between atypical antipsychotic use and hyperglycemia-related adverse reactions is not completely understood. However, epidemiological studies, which did not include GEODON, suggest an increased risk of treatment-emergent hyperglycemia-related adverse reactions in patients treated with the atypical antipsychotics included in these studies. Because GEODON was not marketed at the time these studies were performed, it is not known if GEODON is associated with this increased risk. Precise risk estimates for hyperglycemia-related adverse reactions in patients treated with atypical antipsychotics are not available. In clinical trial and postmarketing experience, events of leukopenia/neutropenia have been reported temporally related to antipsychotic age-nts. Agranulocytosis (including fatal cases) has also been reported. Possible risk factors for leukopenia/neutropenia include pre-existing low white blood cell count (WBC) and history of drug induced leukopenia/neutropenia. Patients with a pre-existing low WBC or a history of drug induced leukopenia/neutropenia should have their complete blood count (CBC) monitored frequently during the first few months of therapy and should discontinue Geodon at the first sign of decline in WBC in the absence of other causative factors. Patients with neutropenia should be carefully monitored for fever or other symptoms or signs of infection and treated promptly if such symptoms or signs occur. Patients with severe neutropenia (absolute neutrophil count <1000/mm3) should discontinue Geodon and have their WBC followed until recovery. As with other drugs that antagonize dopamine D2 receptors, ziprasidone elevates prolactin levels in humans. Increased prolactin levels were also observed in animal studies with this compound, and were associated with an increase in mammary gland neoplasia in mice; a similar effect was not observed in rats [see Nonclinical Toxicology (13.1)]. Tissue culture experiments indicate that approximately one-third of human breast cancers are prolactin-dependent in vitro, a factor of potential importance if the prescription of these drugs is contemplated in a patient with previously detected breast cancer. Although disturbances such as galactorrhea, amenorrhea, gynecomastia, and impotence have been reported with prolactin-elevating compounds, the clinical significance of elevated serum prolactin levels is unknown for most patients. Neither clinical studies nor epidemiologic studies conducted to date have shown an association between chronic administration of this class of drugs and tumorigenesis in humans; the available evidence is considered too limited to be conclusive at this time. Approximately 4.1% (29/702) of ziprasidone-treated patients in short-term, placebo-controlled studies discontinued treatment due to an adverse reaction, compared with about 2.2% (6/273) on placebo. The most common reaction associated with dropout was rash, including 7 dropouts for rash among ziprasidone patients (1%) compared to no placebo patients [See Warnings and Precautions (5.6)]. Table 1 enumerates the incidence, rounded to the nearest percent, of treatment-emergent adverse reactions that occurred during acute therapy (up to 6 weeks) in predominantly patients with schizophrenia, including only those reactions that occurred in 2% or more of patients treated with ziprasidone and for which the incidence in patients treated with ziprasidone was greater than the incidence in placebo-treated patients. Extrapyramidal Symptoms (EPS) - The incidence of reported EPS (which included the adverse reaction terms extrapyramidal syndrome, hypertonia, dystonia, dyskinesia, hypokinesia, tremor, paralysis and twitching) for ziprasidone-treated patients in the short-term, placebo-controlled schizophrenia trials was 14% vs. 8% for placebo. Objectively collected data from those trials on the Simpson-Angus Rating Scale (for EPS) and the Barnes Akathisia Scale (for akathisia) did not generally show a difference between ziprasidone and placebo. Dystonia - Class Effect: Symptoms of dystonia, prolonged abnormal contractions of muscle groups, may occur in susceptible individuals during the first few days of treatment. Dystonic symptoms include: spasm of the neck muscles, sometimes progressing to tightness of the throat, swallowing difficulty, difficulty breathing, and/or protrusion of the tongue. While these symptoms can occur at low doses, they occur more frequently and with greater severity with high potency and at higher doses of first generation antipsychotic drugs. An elevated risk of acute dystonia is observed in males and younger age groups. Weight Gain - The proportions of patients meeting a weight gain criterion of â‰¥7% of body weight were compared in a pool of four 4- and 6-week placebo-controlled schizophrenia clinical trials, revealing a statistically significantly greater incidence of weight gain for ziprasidone (10%) compared to placebo (4%). A median weight gain of 0.5 kg was observed in ziprasidone patients compared to no median weight change in placebo patients. In this set of clinical trials, weight gain was reported as an adverse reaction in 0.4% and 0.4% of ziprasidone and placebo patients, respectively. During long-term therapy with ziprasidone, a categorization of patients at baseline on the basis of body mass index (BMI) revealed the greatest mean weight gain and highest incidence of clinically significant weight gain (>7% of body weight) in patients with low BMI (<23) compared to normal (23â€“27) or overweight patients (>27). There was a mean weight gain of 1.4 kg for those patients with a "low" baseline BMI, no mean change for patients with a "normal" BMI, and a 1.3 kg mean weight loss for patients who entered the program with a "high" BMI. ECG Changes - Ziprasidone is associated with an increase in the QTc interval [see Warnings and Precautions (5.2)]. In the schizophrenia trials, ziprasidone was associated with a mean increase in heart rate of 1.4 beats per minute compared to a 0.2 beats per minute decrease among placebo patients. Following is a list of COSTART terms that reflect treatment-emergent adverse reactions as defined in the introduction to the ADVERSE REACTIONS section reported by patients treated with ziprasidone in schizophrenia trials at multiple doses >4 mg/day within the database of 3834 patients. All reported reactions are included except those already listed in Table 1 or elsewhere in labeling, those reaction terms that were so general as to be uninformative, reactions reported only once and that did not have a substantial probability of being acutely life-threatening, reactions that are part of the illness being treated or are otherwise common as background reactions, and reactions considered unlikely to be drug-related. It is important to emphasize that, although the reactions reported occurred during treatment with ziprasidone, they were not necessarily caused by it. Rare â€“ adverse reactions occurring in fewer than 1/1000 patients (<0.1% of patients). Table 2 enumerates the incidence, rounded to the nearest percent, of treatment-emergent adverse reactions that occurred during acute therapy (up to 3 weeks) in patients with bipolar mania, including only those reactions that occurred in 2% or more of patients treated with ziprasidone and for which the incidence in patients treated with ziprasidone was greater than the incidence in placebo-treated patients. • Extrapyramidal Symptoms includes the following adverse reaction terms: extrapyramidal syndrome, hypertonia, dystonia, dyskinesia, hypokinesia, tremor, paralysis and twitching. None of these adverse reactions occurred individually at an incidence greater than 10% in bipolar mania trials. Weight Gain â€“ During a 6-month placebo-controlled bipolar maintenance study in adults with ziprasidone as an adjunct to lithium or valproate, the incidence of clinically significant weight gain (â‰¥7% of body weight) during the double-blind period was 5.6% for both ziprasidone and placebo treatment groups who completed the 6 months of observation for relapse. Interpretation of these findings should take into consideration that only patients who adequately tolerated ziprasidone entered the maintenance phase of this study, and there were substantial dropouts by the 6 month endpoint. Table 4 enumerates the incidence, rounded to the nearest percent, of treatment-emergent adverse reactions that occurred during acute therapy with intramuscular ziprasidone in 1% or more of patients. Adverse reaction reports not listed above that have been received since market introduction include rare occurrences of the following : Cardiac Disorders: Tachycardia, torsade de pointes (in the presence of multiple confounding factors), [See Warnings and Precautions (5.2)]; Digestive System Disorders: Swollen Tongue; Reproductive System and Breast Disorders: Galactorrhea, priapism; Nervous System Disorders: Facial Droop, neuroleptic malignant syndrome, serotonin syndrome (alone or in combination with serotonergic medicinal products), tardive dyskinesia; Psychiatric Disorders: Insomnia, mania/hypomania; Skin and subcutaneous Tissue Disorders: Allergic reaction (such as allergic dermatitis, angioedema, orofacial edema, urticaria), rash; Urogenital System Disorders: Enuresis, urinary incontinence; Vascular Disorders: Postural hypotension, syncope. Approximately two-thirds of ziprasidone is metabolized via reduction by aldehyde oxidase. There are no known clinically relevant inhibitors or inducers of aldehyde oxidase. Less than one-third of ziprasidone metabolic clearance is mediated by cytochrome P450 catalyzed oxidation. An in vitro enzyme inhibition study utilizing human liver microsomes showed that ziprasidone had little inhibitory effect on CYP1A2, CYP2C9, CYP2C19, CYP2D6 and CYP3A4, and thus would not likely interfere with the metabolism of drugs primarily metabolized by these enzymes. There is little potential for drug interactions with ziprasidone due to displacement [See Clinical Pharmacology (12.3)]. Given the primary CNS effects of ziprasidone, caution should be used when it is taken in combination with other centrally acting drugs. Because of its potential for inducing hypotension, ziprasidone may enhance the effects of certain antihypertensive agents. Ketoconazole, a potent inhibitor of CYP3A4, at a dose of 400 mg QD for 5 days, increased the AUC and Cmax of ziprasidone by about 35â€“40%. Other inhibitors of CYP3A4 would be expected to have similar effects. The absolute bioavailability of a 20 mg dose under fed conditions is approximately 60%. The absorption of ziprasidone is increased up to two-fold in the presence of food [see Clinical Pharmacology (12.3)]. Pregnancy Category C - In animal studies ziprasidone demonstrated developmental toxicity, including possible teratogenic effects at doses similar to human therapeutic doses. When ziprasidone was administered to pregnant rabbits during the period of organogenesis, an increased incidence of fetal structural abnormalities (ventricular septal defects and other cardiovascular malformations and kidney alterations) was observed at a dose of 30 mg/kg/day (3 times the MRHD of 200 mg/day on a mg/m2 basis). There was no evidence to suggest that these developmental effects were secondary to maternal toxicity. The developmental no-effect dose was 10 mg/kg/day (equivalent to the MRHD on a mg/m2 basis). In rats, embryofetal toxicity (decreased fetal weights, delayed skeletal ossification) was observed following administration of 10 to 160 mg/kg/day (0.5 to 8 times the MRHD on a mg/m2 basis) during organogenesis or throughout gestation, but there was no evidence of teratogenicity. Doses of 40 and 160 mg/kg/day (2 and 8 times the MRHD on a mg/m2 basis) were associated with maternal toxicity. The developmental no-effect dose was 5 mg/kg/day (0.2 times the MRHD on a mg/m2 basis). Ziprasidone intramuscular has not been systematically evaluated in elderly patients (65 years and over). Intramuscular ziprasidone has not been systematically evaluated in elderly patients or in patients with hepatic or renal impairment. As the cyclodextrin excipient is cleared by renal filtration, ziprasidone intramuscular should be administered with caution to patients with impaired renal function [see Clinical Pharmacology (12)]. As ziprasidone is cleared substantially by the liver, the presence of hepatic impairment would be expected to increase the AUC of ziprasidone; a multiple-dose study at 20 mg twice daily for 5 days in subjects (n=13) with clinically significant (Childs-Pugh Class A and B) cirrhosis revealed an increase in AUC 0â€“12 of 13% and 34% in Childs-Pugh Class A and B, respectively, compared to a matched control group (n=14). A half-life of 7.1 hours was observed in subjects with cirrhosis compared to 4.8 hours in the control group. In premarketing trials involving more than 5400 patients and/or normal subjects, accidental or intentional overdosage of oral ziprasidone was documented in 10 patients. All of these patients survived without sequelae. In the patient taking the largest confirmed amount, 3,240 mg, the only symptoms reported were minimal sedation, slurring of speech, and transitory hypertension (200/95). GEODON Capsules contain a monohydrochloride, monohydrate salt of ziprasidone. Chemically, ziprasidone hydrochloride monohydrate is 5-[2-[4-(1,2-benzisothiazol-3-yl)-1-piperazinyl]ethyl]-6-chloro-1,3-dihydro-2H-indol-2-one, monohydrochloride, monohydrate. The empirical formula is C21H21ClN4OS HCl H2O and its molecular weight is 467.42. Ziprasidone hydrochloride monohydrate is a white to slightly pink powder. GEODON Capsules are supplied for oral administration in 20 mg (blue/white), 40 mg (blue/blue), 60 mg (white/white), and 80 mg (blue/white) capsules. GEODON Capsules contain ziprasidone hydrochloride monohydrate, lactose, pregelatinized starch, and magnesium stearate. GEODON for Injection contains a lyophilized form of ziprasidone mesylate trihydrate. Chemically, ziprasidone mesylate trihydrate is 5-[2-[4-(1,2-benzisothiazol-3-yl)-1-piperazinyl]ethyl]-6-chloro-1,3-dihydro-2H-indol-2-one, methanesulfonate, trihydrate. The empirical formula is C21H21ClN4OS CH3SO3H 3H2O and its molecular weight is 563.09. GEODON for Injection is available in a single-dose vial as ziprasidone mesylate (20 mg ziprasidone/mL when reconstituted according to label instructions) [See Dosage and Administration (2.3)]. Each mL of ziprasidone mesylate for injection (when reconstituted) contains 20 mg of ziprasidone and 4.7 mg of methanesulfonic acid solubilized by 294 mg of sulfobutylether Î²-cyclodextrin sodium (SBECD). Ziprasidone exhibited high in vitro binding affinity for the dopamine D2 and D3, the serotonin 5HT2A, 5HT2C, 5HT1A, 5HT1D, and Î±1-adrenergic receptors (Ki s of 4.8, 7.2, 0.4, 1.3, 3.4, 2, and 10 nM, respectively), and moderate affinity for the histamine H1 receptor (Ki=47 nM). Ziprasidone functioned as an antagonist at the D2, 5HT2A, and 5HT1D receptors, and as an agonist at the 5HT1A receptor. Ziprasidone inhibited synaptic reuptake of serotonin and norepinephrine. No appreciable affinity was exhibited for other receptor/binding sites tested, including the cholinergic muscarinic receptor (IC50 >1 µM). Antagonism at receptors other than dopamine and 5HT2 with similar receptor affinities may explain some of the other therapeutic and side effects of ziprasidone. Ziprasidone's antagonism of histamine H1 receptors may explain the somnolence observed with this drug. 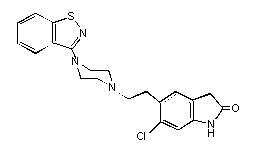 Ziprasidone's antagonism of Î±1-adrenergic receptors may explain the orthostatic hypotension observed with this drug. Distribution: Ziprasidone has a mean apparent volume of distribution of 1.5 L/kg. It is greater than 99% bound to plasma proteins, binding primarily to albumin and Î±1-acid glycoprotein. The in vitro plasma protein binding of ziprasidone was not altered by warfarin or propranolol, two highly protein-bound drugs, nor did ziprasidone alter the binding of these drugs in human plasma. Thus, the potential for drug interactions with ziprasidone due to displacement is minimal. Metabolism and Elimination: Ziprasidone is extensively metabolized after oral administration with only a small amount excreted in the urine (<1%) or feces (<4%) as unchanged drug. Ziprasidone is primarily cleared via three metabolic routes to yield four major circulating metabolites, benzisothiazole (BITP) sulphoxide, BITP-sulphone, ziprasidone sulphoxide, and S-methyl-dihydroziprasidone. Approximately 20% of the dose is excreted in the urine, with approximately 66% being eliminated in the feces. Unchanged ziprasidone represents about 44% of total drug-related material in serum. In vitro studies using human liver subcellular fractions indicate that S-methyl-dihydroziprasidone is generated in two steps. The data indicate that the reduction reaction is mediated by aldehyde oxidase and the subsequent methylation is mediated by thiol methyltransferase. In vitro studies using human liver microsomes and recombinant enzymes indicate that CYP3A4 is the major CYP contributing to the oxidative metabolism of ziprasidone. CYP1A2 may contribute to a much lesser extent. Based on in vivo abundance of excretory metabolites, less than one-third of ziprasidone metabolic clearance is mediated by cytochrome P450 catalyzed oxidation and approximately two-thirds via reduction by aldehyde oxidase. There are no known clinically relevant inhibitors or inducers of aldehyde oxidase. Systemic Bioavailability: The bioavailability of ziprasidone administered intramuscularly is 100%. After intramuscular administration of single doses, peak serum concentrations typically occur at approximately 60 minutes post-dose or earlier and the mean half-life (T½) ranges from two to five hours. Exposure increases in a dose-related manner and following three days of intramuscular dosing, little accumulation is observed. Lifetime carcinogenicity studies were conducted with ziprasidone in Long Evans rats and CD-1 mice. Ziprasidone was administered for 24 months in the diet at doses of 2, 6, or 12 mg/kg/day to rats, and 50, 100, or 200 mg/kg/day to mice (0.1 to 0.6 and 1 to 5 times the maximum recommended human dose [MRHD] of 200 mg/day on a mg/m2 basis, respectively). In the rat study, there was no evidence of an increased incidence of tumors compared to controls. In male mice, there was no increase in incidence of tumors relative to controls. In female mice, there were dose-related increases in the incidences of pituitary gland adenoma and carcinoma, and mammary gland adenocarcinoma at all doses tested (50 to 200 mg/kg/day or 1 to 5 times the MRHD on a mg/m2 basis). Proliferative changes in the pituitary and mammary glands of rodents have been observed following chronic administration of other antipsychotic agents and are considered to be prolactin-mediated. Increases in serum prolactin were observed in a 1-month dietary study in female, but not male, mice at 100 and 200 mg/kg/day (or 2.5 and 5 times the MRHD on a mg/m2 basis). Ziprasidone had no effect on serum prolactin in rats in a 5-week dietary study at the doses that were used in the carcinogenicity study. The relevance for human risk of the findings of prolactin-mediated endocrine tumors in rodents is unknown [see Warnings and Precautions (5.11)]. A study was conducted in stable chronic or subchronic (CGI-S â‰¤5 at baseline) schizophrenic inpatients (n=294) who had been hospitalized for not less than two months. After a 3-day single-blind placebo run-in, subjects were randomized to one of 3 fixed doses of ziprasidone (20 mg, 40 mg, or 80 mg twice daily) or placebo and observed for relapse. Patients were observed for "impending psychotic relapse," defined as CGI-improvement score of â‰¥6 (much worse or very much worse) and/or scores â‰¥6 (moderately severe) on the hostility or uncooperativeness items of the PANSS on two consecutive days. Ziprasidone was significantly superior to placebo in time to relapse, with no significant difference between the different dose groups. There were insufficient data to examine population subsets based on age and race. Examination of population subsets based on gender did not reveal any differential responsiveness. The results of the oral ziprasidone trials in adult bipolar I disorder, manic/mixed episode follow: in a 3-week placebo-controlled trial (n=210), the dose of ziprasidone was 40 mg twice daily on Day 1 and 80 mg twice daily on Day 2. Titration within the range of 40â€“80 mg twice daily (in 20 mg twice daily increments) was permitted for the duration of the study. Ziprasidone was significantly more effective than placebo in reduction of the MRS total score and the CGI-S score. The mean daily dose of ziprasidone in this study was 132 mg. In a second 3-week placebo-controlled trial (n=205), the dose of ziprasidone was 40 mg twice daily on Day 1. Titration within the range of 40â€“80 mg twice daily (in 20 mg twice daily increments) was permitted for the duration of study (beginning on Day 2). Ziprasidone was significantly more effective than placebo in reduction of the MRS total score and the CGI-S score. The mean daily dose of ziprasidone in this study was 112 mg. The efficacy of ziprasidone as adjunctive therapy to lithium or valproate in the maintenance treatment of bipolar I disorder was established in a placebo-controlled trial in patients who met DSM-IV criteria for bipolar I disorder. The trial included patients whose most recent episode was manic or mixed, with or without psychotic features. In the open-label phase, patients were required to be stabilized on ziprasidone plus lithium or valproic acid for at least 8 weeks in order to be randomized. In the double-blind randomized phase, patients continued treatment with lithium or valproic acid and were randomized to receive either ziprasidone (administered twice daily totaling 80 mg to 160 mg per day) or placebo. Generally, in the maintenance phase, patients continued on the same dose on which they were stabilized during the stabilization phase. The primary endpoint in this study was time to recurrence of a mood episode (manic, mixed or depressed episode) requiring intervention, which was defined as any of the following: discontinuation due to a mood episode, clinical intervention for a mood episode (e.g., initiation of medication or hospitalization), or Mania Rating Scale score â‰¥ 18 or a MADRS score â‰¥18 (on 2 consecutive assessments no more than 10 days apart). A total of 584 subjects were treated in the open-label stabilization period. In the double-blind randomization period, 127 subjects were treated with ziprasidone, and 112 subjects were treated with placebo. Ziprasidone was superior to placebo in increasing the time to recurrence of a mood episode. The types of relapse events observed included depressive, manic, and mixed episodes. Depressive, manic, and mixed episodes accounted for 53%, 34%, and 13%, respectively, of the total number of relapse events in the study. The efficacy of intramuscular ziprasidone in the management of agitated schizophrenic patients was established in two short-term, double-blind trials of schizophrenic subjects who were considered by the investigators to be "acutely agitated" and in need of IM antipsychotic medication. In addition, patients were required to have a score of 3 or more on at least 3 of the following items of the PANSS: anxiety, tension, hostility and excitement. Efficacy was evaluated by analysis of the area under the curve (AUC) of the Behavioural Activity Rating Scale (BARS) and Clinical Global Impression (CGI) severity rating. The BARS is a seven point scale with scores ranging from 1 (difficult or unable to rouse) to 7 (violent, requires restraint). Patients' scores on the BARS at baseline were mostly 5 (signs of overt activity [physical or verbal], calms down with instructions) and as determined by investigators, exhibited a degree of agitation that warranted intramuscular therapy. There were few patients with a rating higher than 5 on the BARS, as the most severely agitated patients were generally unable to provide informed consent for participation in premarketing clinical trials. • In a one-day, double-blind, randomized trial (n=79) involving doses of ziprasidone intramuscular of 20 mg or 2 mg, up to QID, ziprasidone intramuscular 20 mg was statistically superior to ziprasidone intramuscular 2 mg, as assessed by AUC of the BARS at 0 to 4 hours, and by CGI severity at 4 hours and study endpoint. • In another one-day, double-blind, randomized trial (n=117) involving doses of ziprasidone intramuscular of 10 mg or 2 mg, up to QID, ziprasidone intramuscular 10 mg was statistically superior to ziprasidone intramuscular 2 mg, as assessed by AUC of the BARS at 0 to 2 hours, but not by CGI severity. GEODON Capsules should be stored at 25°C (77°F); excursions permitted to 15â€“30°C (59â€“86°F) [See USP Controlled Room Temperature]. GEODON for Injection should be stored at 25°C (77°F); excursions permitted to 15â€“30°C (59â€“86°F) [See USP Controlled Room Temperature] in dry form. Protect from light. Following reconstitution, GEODON for Injection can be stored, when protected from light, for up to 24 hours at 15°â€“30°C (59°â€“86°F) or up to 7 days refrigerated, 2°â€“8°C (36°â€“46°F). See FDA-Approved Patient Labeling (17.3). Please refer to the patient package insert. To assure safe and effective use of GEODON, the information and instructions provided in the patient information should be discussed with patients. Patients should be instructed to take GEODON Capsules with food for optimal absorption. The absorption of ziprasidone is increased up to two-fold in the presence of food [see Drug Interactions (7.8) and Clinical Pharmacology (12.3)]. Patients should be advised to inform their health care providers of the following: History of QT prolongation; recent acute myocardial infarction; uncompensated heart failure; prescription of other drugs that have demonstrated QT prolongation; risk for significant electrolyte abnormalities; and history of cardiac arrhythmia [see Contraindications (4.1) and Warnings and Precautions (5.2)]. Patients should be instructed to report the onset of any conditions that put them at risk for significant electrolyte disturbances, hypokalemia in particular, including but not limited to the initiation of diuretic therapy or prolonged diarrhea. In addition, patients should be instructed to report symptoms such as dizziness, palpitations, or syncope to the prescriber [see Warnings and Precautions (5.2)]. Store GEODON capsules at room temperature (59°â€“86°F or 15°â€“30°C).